How does a Mastergard M6000 Immobilizer protect my car? A Mastergard M6000 Immobilizer is an electronic device that arms automatically when the vehicle is switched off and stops any unauthorized starting of the vehicle. 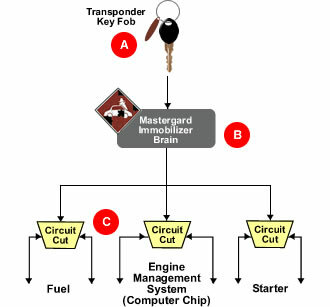 Mastergard’s M6000 Immobilizer stops thieves because the brain (labeled above) disengages multiple engine operation circuits or vital engine control units (e.g. 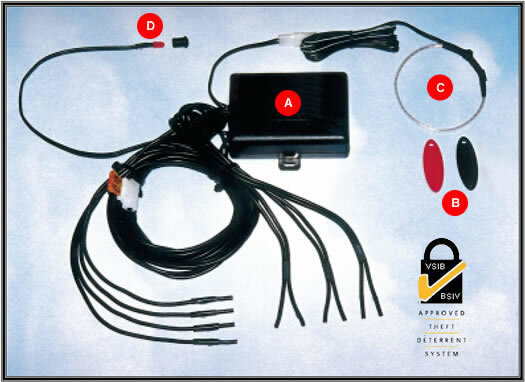 Starter, Ignition and Fuel Supply, see above), so that it cannot be started without a transponder key fob (labeled above), thereby preventing the vehicle from being started, let alone driven away. In the nine years that the Insurance Bureau of Canada (IBC) has been tracking such thefts, no vehicle in Canada with an immobilizer meeting the national standard has been stolen due to the defeat of an immobilizer. Our company has a basic philosophy regarding the installation of any Mastergard product and that is “the product is only as good as the installation.” The best product in the world can be ineffective if the installation is not done properly. Since the inception of the company, we have realized the importance of the installation and that is why we have always insisted that anyone who installs our products must receive hands-on training conducted by the VSIB. This training ensures that installers of our Mastergard immobilizers comply with the Canadian installation standards of practice – the Canadian Standard for Installation of Automobile Theft Deterrent Equipment and Systems (CAN/ULC-ORD S.275.1), and have received VSIB certification.